Region: This scale can be found throughout the United States and southern Canada. Life cycle: This insect produces up to six generations each year and overwinters as nymphs on the bark of the host plants. Physical Description: This Scale is gray with a dark projection in the middle and little yellow sacs underneath. The adult female is yellow and about the size of a pinhead. It lives under a protective cover that form over it as it grows. The adult scale is stationary most of it life. Only the newly born nymphs, called crawlers, move about on the tree. The crawlers are yellow and are born alive. Feeding characteristics: This pest attacks apple, cherry, peach, pear, pecan, and quince plants by feeding in colonies on bark and fruits. They will often cause a reddish, inflamed area to form around them and can result in the death of the tree if untreated. Controls: Spray the trees with dormant-oil early in the spring, just as the buds begin to swell, but before the blossoms open. Repeat one week later for best results. 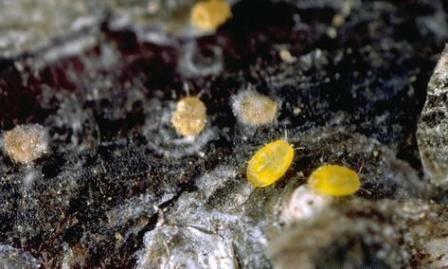 Aphytis melinus, a commercially available parasite, will attack this particular scale.